Friday food is a weekly article about one of the more unusual food items to be found in Liuzhou that week. This week, we are getting sour. China has been brewing vinegar for thousands of years and the choice in the supermarkets and other stores can be bewildering. There are three basic types, defined by colour – white, black and red. Examples of all three are found easily in Liuzhou. White rice vinegar (白米醋) actually varies from crystal clear to lightish brown-yellow. This is made from fermented glutinous rice and is the most available and cheapest – around ¥7 or ¥8 for a 500ml bottle.. This is also sold in bags. Very cheap. ¥1 for this 400ml bag. Black vinegar (黑米醋) is made from rice, but may also contain wheat or sorghum as well. Generic black vinegar is easily available at round the same price as the white vinegar above, although I haven’t seen that one in bags. However, two of the more prized vinegars in China are also, black. 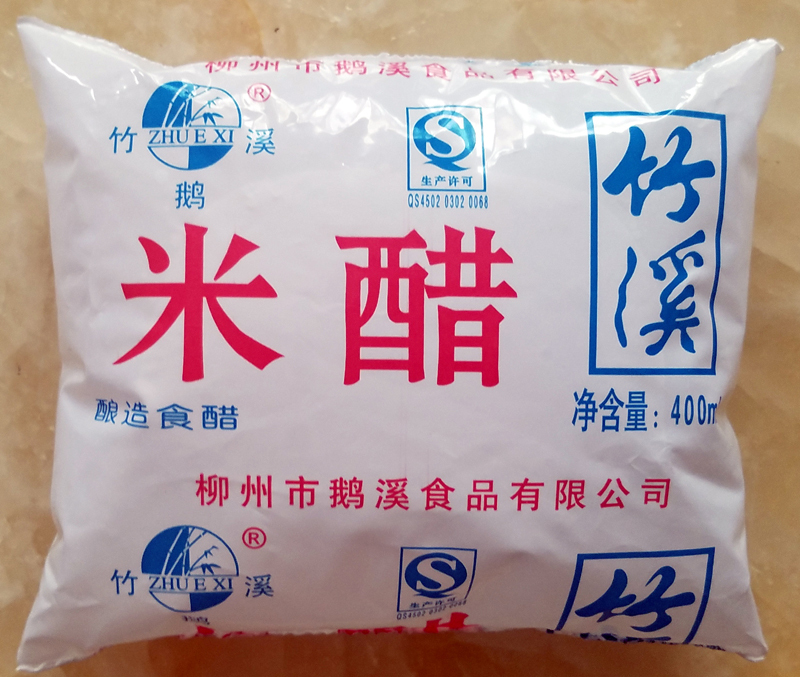 Shanxi Aged Vinegar (山西老陈醋), as the name suggests is from the northern province of Shanxi (山西), where it is used in noodles dishes, sauces and as a dip for jiaozi dumplings. This is only slightly more expensive than the ordinary vinegars. Zhenjiang Fragrant Vinegar (镇江香醋) (once transliterated as Chinkiang) is a deeply flavoured, smoky, fruity vinegar with umami notes, leaving a rich aftertaste. It is often compared to the Italian balsamic vinegar, but is less sweet. The vinegar originates from the city of Zhenjiang in Jiangsu (江苏) province, east China. This 6 year-old version cost ¥28.80 for 580ml – three times the price of the other vinegars (Bubugao supermarket is up to its usual tricks and selling the exact same bottle for a criminal ¥38.80). Finally we have red vinegar (红浙醋) from Zhejiang (浙江) province, also in east China bordering Jiangsu and Shanghai. It is particularly suitable with seafood dishes, but also as a dip. Traditionally, the vinegar is made from rice with the addition of a yeast (Monascus purpureus) which gives the red colour, but today red food colouring often extracted from red radish is often used to colour standard white rice vinegar.
. This entry was posted on Friday, September 7th, 2018 at 3:45 pm	and is filed under Bubugao, Food and Drink, Friday Food. You can follow any responses to this entry through the RSS 2.0 feed. Both comments and pings are currently closed.